Located at 199 Richmond St. West in Toronto, Onsite Gallery is OCAD University's flagship professional exhibition space. Its mandate is to mix emerging and established artists, and it's fabulous. Moreover, given its work-friendly hours (12 - 8 pm Wed, 12 - 7 pm Thurs/Fri, 12 - 5 pm Sat/Sun) and free admission, it's a great place to get a quick inspirational re-charge at lunch or before heading home for the day. I recently had the privilege of being shown the current exhibition, The Sunshine Eaters, by Francisco Alvarez, Executive Director of OCAD U's nine galleries. The Exhibition highlights how contemporary artists use the natural world to deal with crises and talk about hope. Initially, the magical costumes of Nick Cave draw the eye. Created by collected items, often from thrift shops, these Soundsuits (one of which was actually worn by Nick Cave on stage) are designed to obscure the wearer, removing biases around race, gender, age or class. The Soundsuits celebrate whimsy, colour, detailed beadwork and toys that throw back to Cave's childhood, and yet hint at more ominous references, reminding the view of a KKK hood. Laying half on the ground and half on the wall is Alexandra Kehayoglou's Stele, created by hand from discards from her grandparents' carpet factory in Argentina. While one of her smaller works - the larger ones often contain streams and boulders - it still captures the essence of the Argentine grasslands, the pampas. If you have seen the Dries Van Noten documentary on Netflix, in the opening sequence the models walk on a carpet made by Kehayoglou. Tony Matelli's incredibly life-like renderings of lilies (presented impossibly, perfectly upside down) and nearly-missable Weed, quietly growing out of the crack between wall and floor, involve you directly in the process of art making: when the viewer realizes the pieces aren't real, or that they're not made out of plastic but rather bronze, it's that moment of surprise which is the true art, according to Matelli. The same art experience occurs with his NYC-based Sleepwalker on the Highline. 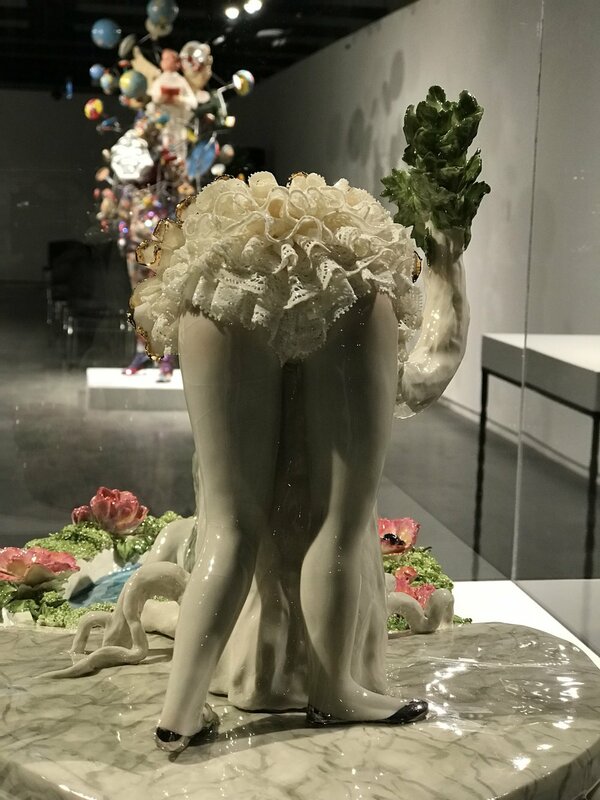 It's unusual to include scent-based work in a gallery setting. You are encouraged to smell the two bottles of perfume by Nina Leo and Moez Surani. The one on the right for me particularly jolted a cascading reminiscence of childhood memories - at once familiar, but impossible to place. It's only afterwards you learn that the perfumes were created by perfumers who grew up in infamous cities carrying international stigma: Hiroshima, Japan and Waco, Texas. What I also found fascinating is how distinctive the perfumes were from each other, despite being given the same project direction. 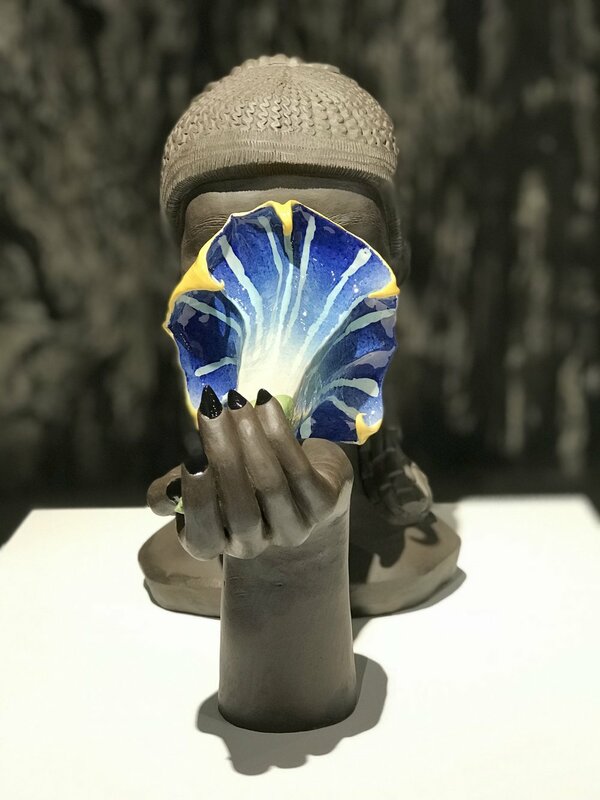 Other works included The Thicket by Jim Holyoak, a single, three-wall ink drawing of a banyan tree Canadian artist Shary Boyle suggested as a backdrop for her three ceramic pieces. Out of pencil crayons and cut paper, Winny Truong, a Toronto-based emerging artist, created zaftig, mischievous nymphs frolicking through delicate plants, always turning their backs on the viewer, save for those who look at us, but obscured by meticulously-crafted masks. 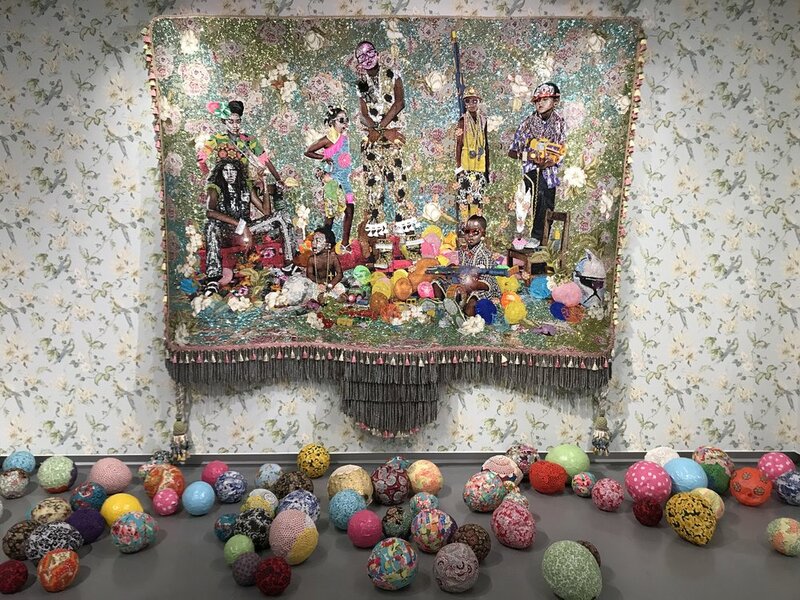 For me, the piece that resonated the most was Bad Pickney from the Fambily series by American artist Ebony G. Patterson. At first I was taken in by the bedazzled, colourful, embellished tapestry and the scattered colourful balls on the floor in front of the work, and I was amused to learn this piece had begun as a custom-printed carpet ordered through, of all places, Walmart. 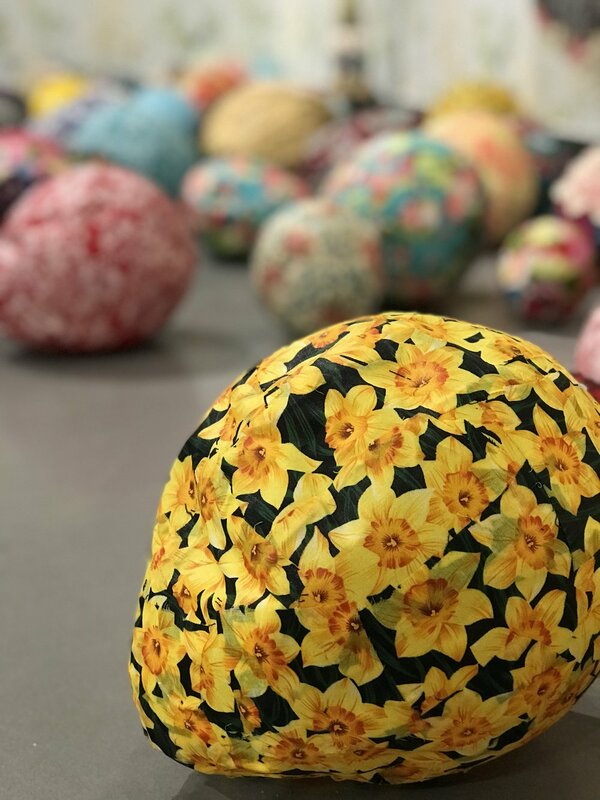 But my heart broke when I was told that all the children represented in the work are real children who were murdered, and that the piece represented a birthday party they would never have, the colourful balls on the ground leftover balloons, some already deflating. Because black children are often described in the media as hoodlums, Patterson keys on the stereotype by dressing them with guns and gangsta bling. Her intention is to make these children visible, driving home the point that black kids killed in violence are children too, filled with the same sense of optimism, play, insecurities, curiosities and pain as other children. The Sunshine Eaters runs until April 15. Do yourself a favour and check it out.